The Oldsmobile line was completely redesigned for 1954, with a squarer, slab-sided design attractively divided by trim lines. There were 18 solid colors and 18 two-tone combinations available and all models got wrap-around windshields. Oldsmobile sold 354,001 units and moved up to fourth place. The Oldsmobile 88 remained the entry-level model, with two- and four-door sedans, and a two-door Hollywood hardtop. The Super 88 was the mid-line model, and it added a convertible to the same lineup. The 324-cid Rocket V-8 remained the only engine choice, with a two-barrel setup producing 170 hp on the Series 88 and a four-barrel carb producing 185 hp on the Super 88. 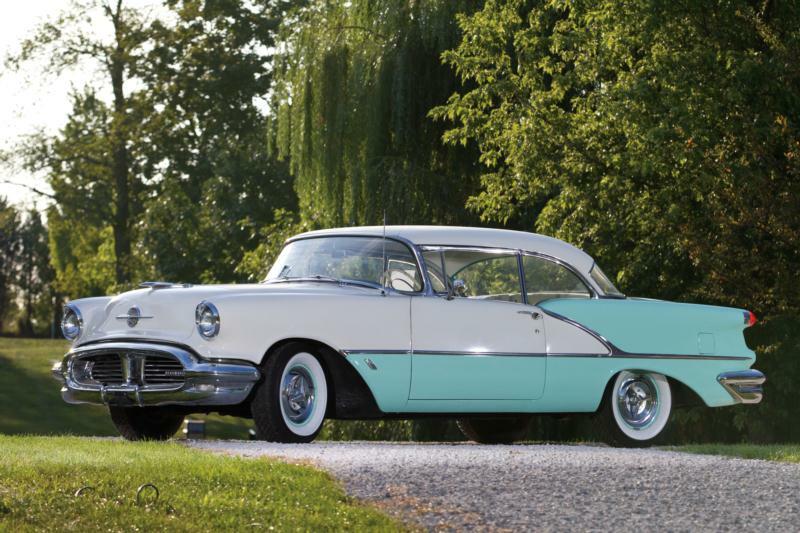 The two-tone trims returned in 1955, and the Olds name floated in the grille instead of on the hood. The Holiday name appeared on a four-door hardtop this year for both the base and Super 88, and compression was increased on the engine to now produce either 185 hp or 202 hp. The 1956 Oldmobiles grew a massive concave chrome grille and bumper, which would grow even bigger for 1957. There were now 19 two-tone color combinations, and the side trim was smoothed out still further. The 324-cid V-8 again grew more aggressive on its way to developing 230 hp with a two-barrel carb and 240 hp with the four-barrel unit. A new Jetaway automatic transmission was optional, with a second fluid pump. Oldsmobiles from this period are known for the quality of their construction, decent performance, and durability. They also came in a remarkable range of colors, though repaints in the more extreme “Easter egg” tones are commonplace. Oldsmobile 88s were typically well equipped when new, so air conditioning, and power brakes, steering, and windows are easily found, all of which make driving one of these great cars more enjoyable today.